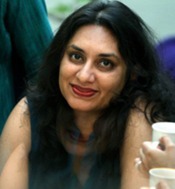 Bina Shah is a writer of English fiction and a journalist living in Karachi, Pakistan. She is the author of four novels and two collections of short stories. She is a regular columnist for the Dawn and the Express Tribune, Pakistan�s major English-language newspapers, and has also contributed to international newspapers The Guardian, The Independent, and the International Herald Tribune and international journals Granta.com, Wasafiri and Critical Muslim. Bina was born in Karachi, Pakistan and was raised in Charlottesville, Virginia, and Pakistan. She holds a degree in Psychology from Wellesley College and a Masters in Education from the Harvard Graduate School of Education. She is a fellow of the University of Iowa, having participated in the International Writers Program in 2011. Her humorous writing, political satire, and clear-eyed view of social issues have earned her critical praise and a devoted following amongst Pakistanis all over the world.